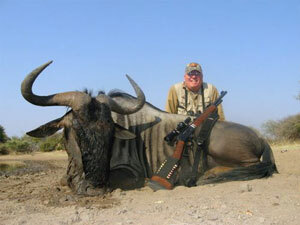 Cruiser Safaris hunting client Mike Cochran, reference letter and hunting photos. 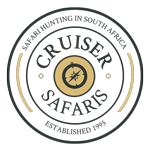 Cruiser Safaris was my trip of a lifetime! The planning of the trip was expertly handled by Cruiser Bob, and I can't thank him enough for his expertise. Everything, from beginning to end, went off without a hitch. I really want to thank Pieter and Lizelle, for their gracious hospitality. I especially want to thank Craig for putting up with this ole geezer for 10 days. 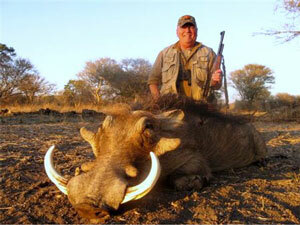 All the trophies were "big enough"! Tanya, the cook put out such fabulous meals, I wanted to smuggle her home. The laughs and discussions around the fire at night were fabulous. Thanks Grassie, Johann, Jaco and Hans for the great camaraderie, and hospitality. 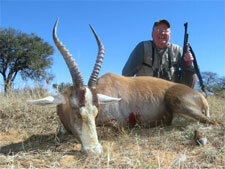 You could do no better anywhere than hunting with CRUISER SAFARIS! Mike hunted with Cruiser Safaris in July 2008.